Positions in the lower tier of the service sector are part of the secondary labor market, characterized by low wages. little job security, few chances for advancement, higher unemployment rates, and very limited (if any)unemployment benefits. Typical lower-tier posllions include janitor. waitress, messenger, sales clerk, typist, file clerk, migrant laborer, and textile worker. Large numbers of young people, people of color. recent immigrants, and white women are employed in this sector (Callaghan and Hartmann, 1991).·ln a study of Mexican American women. for example. 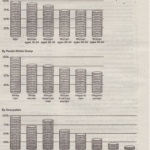 the sociologist Denise Segura (1994) concluded that people areoften channeled into lower-tier jobs based on their race/ethnicity, class, and gender. In addition, schooling and employment training programs rarely provide . Mexican American women with a sense that they have employment options outside those traditionally ascribed lo Latinas (Segura. 1994). . According to the employment norms of this country. a job should (1) be legal; (2) be covered by government work regulations, such as minimum standards of pay, working conditions, and safety standards; (3) be relatively permanent; and (4) provide adequate pay with sufficient hours of work each week to make a living (Hodson and Sullivan, 2008). However, many lower-tier service sector jobs do not meet these norms and are therefore marginal. Marginal jobs differ from the employment norms of the society in which they are located; examples in the U.S. labor market inc1ude .inc1ude personal service workers and private household workers. Personal Service Worker: More than 11 million workers are employed in personal service industries. lmost 6 million of them are employed in eating and drinking places, ab~ut 2 million in hotels. and another 3 million in laundries. beauty shops, and household service. primarily maid service (Hodson and Sullivan. 2008). Service workers are often viewed by customers as subordinates or personal servants. Frequently, they are required to wear a uniform that reflects their lowly status as a waitperson, fast-food server, maid, or porter. 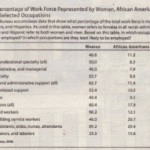 Occupational segregation by race and gender (see Chapters 10 and 1J) is clearly visible in personal service industries. In 2000. for example, 23.8 percent of all employed Latinas age 16 and over were employed in service occupations. as compared with 16.4 percent of white (non-Latina) females and 9.1 percent of white (non-Latino) males (U.S. Bureau of Labor Statistics, 2000). to their workday. Household work is marginal: It lacks regularity, stability, and adequacy. The jobs are excluded from most labor legislutjon, the workers are not unionized, and employers often feel that they can lIout any rules or regulations. Many employers pay cash in order to avoid payroll taxes and Social Security; the jobs typically have no unemployment, health insurance, or retirement benefits (Hodson and Sullivan, 2008). In many cities, an increasing number of household workers are recent immigrants, some of whom are undocumented and could easily be deported by immigration authorities if their wliereabouts were known. Consequently, these workers are among the most powerless. They cannot rely on any resources, including local law enforcement. to protect them from abuse-whether financial, physical, or sexual-by their employers. Even . employers who are not overtly abusive often seek to control the labor of domestic workers more than those workers believe to be necessary or humane. In her ethnographic research on immigrant domestic workers, Pierrette Hondagneu-Sotelo (200 I: 158) recorded this statement from Erlinda Castro (a pseudonym), a Guatemalan woman employed as a housecleaner in Los Angeles: The bad [employer] for us is the one who's there cranell/ldo [using her cranium), as we say, trying to devise new work to make the exact eight hours, "Clean the patio around the pool! Wash the patio chairs! Clean the garage! Go sweep outside!" That's the bad one, the one who wants a full eight hours. It's inconsiderate, 'and among ourselves we say, "They are wringing us out!" They are wringing us . out for forty or fifty dollars . Internationalization of Marginal Jobs Not only in domestic work but also in other types of marginal employment, many workers (eel that they are being "wrung out" by their employers. Some manufacturing jobs fall into this marginal category. Marginal jobs are more likely to be found in peripheral industries than in core, or essential, industries. Peripheral industries tend to be in highly competitive industries. (such as garment or microelectronics manufacturing) that operate in markets where prices are subject to sudden, intense ftuctuations and where labor is a significant . only grown worse in recent yea s. as businesses havesought new ways to cut overhead and reduce the number of workers they have on their payrolls. Consequently, contingent work has become increasingly popular as an economic strategy of employers.